The shoulder is the one of the most flexible parts of the human body. Unfortunately, the flexibility of the shoulder makes it an extremely fragile joint. The acromioclavicular joint is located between the acromion ( that part of the scapula that forms the highest point of the shoulder) and the clavicle. The glenohumeral joint, commonly called the shoulder joint, is a ball-and-socket type joint that helps move the shoulder forward and backward and allows the arm to rotate in a circular fashion or hinge out and up away from the body. (The “ball,” or humerus is the top rounded portion of the upper arm bone; the “socket,” or glenoid is a dish-shaped part of the outer edge of the scapula into which the ball fits.) The capsule is a soft tissue envelope that encircles the glenohumeral joint. It is lined by a thin, smooth synovial membrane. Most ball and socket joints are constructed of a large socket into which the ball fits nicely. This is a very stable type of joint. The shoulder joint, on the other hand, is made up of a ball which is larger than the socket. This is not a very stable type of joint. Because the shoulder’s ball-and-socket joint provides little inherent stability, it is highly dependent on the surrounding soft tissues such as the capsule, ligaments and muscles to hold the ball in place. The relative instability of the shoulder joint allows it to be highly mobile, thus allowing an individual to place the hand in numerous positions. Ligaments attach shoulder bones to each other, providing stability. For example, the front of the joint capsule is anchored by three glenohumeral ligaments. Two filmy sac-like structures called bursae permit smooth gliding between bones, muscles, and tendons. They cushion and protect the rotator cuff from the bony arch of the acromion. Muscles are bundles of specialized tissue that attach to, and move bones via their tendons. The rotator cuff consists of four muscles and several tendons that form a covering around the top of the upper arm bone (humerus). These muscles form a cover around the head of the humerus. 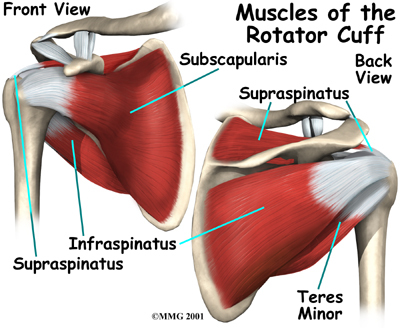 The rotator cuff holds the humerus in place in the shoulder joint and enables the arm to rotate. Two filmy sac-like structures called bursae permit smooth gliding between bones, muscles, and tendons. They cushion and protect the rotator cuff from the bony arch of the acromion. The shoulder is susceptible to numerous injuries, some of the more common injuries are listed below. To learn more, just click on the title.